The electric current that flow through a protective grounding wire to the ground is knows as earth leakage current. 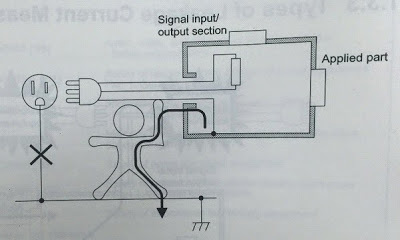 For class I equipment, earth leakage current is measured as shown in figure 1. The earth leakage test is valid for class 1 equipment with Type B, BF and CF applied part. According to IEC 60601-1 standard Earth Leakage Current (8.7.3 d) . The allowable earth leakage current to 5mA in normal condition and 10mA under single fault condition. 1. As shown in the figure 1 , Connect the instrument to the equipment under test with the power cord. 2. Start earth leakage current measurement. 1. The allowable earth leakage current to 5mA in normal condition and 10mA under single fault condition. If you have any query regarding earth leakage current testing and Certification. Kindly send us your testing requirements with the product technical details to submit you our testing charges. We are waiting for your earliest reply. You can call or write us for any clarification. This entry was posted in Earth leakage current Test according to (IEC 60601-1) and tagged causes of earth leakage current, Earth leakage current Test, Earth leakage current Testing lab, earth leakage testing lab, earth leakage testing lab Ahmedabad, earth leakage testing lab Chennai, earth leakage testing lab Delhi, earth leakage testing lab India, earth leakage testing lab Mumbai, earth leakage testing laboratory, earth leakage testing procedure, Earth Leakage Tests, Earth Leakage Trip...Here's what to do., ground leakage current, Gujarat, how to measure earth leakage current, how to measure leakage current, IEC 60601-1, India, Leakage current measurement, Leakage Current Testing, Testing a Theory: Earth Leakage.